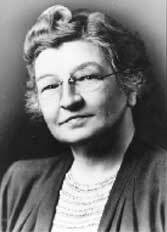 Edith Clarke, an electrical engineer with expertise in power systems, was influential in the design of dams in the American West. Clarke became an Associate Member in 1923, and in 1948, she was the first woman elected a Fellow of the American Institute of Electrical Engineers (AIEE) . In February 1926, Clarke became the first woman to present a paper at an AIEE meeting. This paper, “Steady-State Stability in Transmission Systems,” was later published in AIEE Transactions." Clarke later earned the AIEE’s 1932 Best Regional Paper Prize and the 1941 National Paper Prize. Her two volume work, "Circuit Analysis of A-C Power Systems," was published in 1943 and 1950. The first woman to earn an electrical engineering graduate degree from the Massachusetts Institute of Technology (MIT), Clarke was also the first woman to teach in the engineering department of the University of Texas-Austin. Edith Clarke was born in 1883 in Ellicott City, a small rural community in Maryland, during a time when few women earned a college degree. Clarke was orphaned at an early age and used her small inheritance to enroll at Vassar College in Poughkeepsie, New York. She studied mathematics and astronomy and received an A.B. degree in 1908. In 1912, Clarke became a computing assistant to George A. Campbell at AT&T. During her tenure, she learned a great deal about the theory of transmission lines and electric circuits. In 1918, she enrolled at MIT and earned an M.S. in electrical engineering in 1919. Clarke worked at General Electric (GE) from 1919 until 1945, originally hired with the job title “computer.” She left GE for one year in 1921 to teach physics at the Constantinople Women’s College in Turkey. In 1921, Clarke also filed a patent for a graphical calculator that was used for solving electric power transmission line computations. In 1922, GE officially recognized Clarke as a salaried electrical engineer. Clarke retired from GE in 1945 and joined the electrical engineering faculty at the University of Texas-Austin in 1947. After retiring from teaching in 1956, Clarke returned to her native Maryland.